Being happily married all comes down to following these 26 simple nuggets of wisdom. 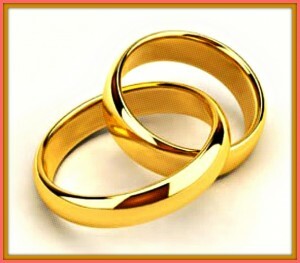 West Fargo, ND – With wedding season just around the coroner, your FM Observer is offering free marriage counseling advice to those who seek to soon enter the gates of matrimonial blissful harmony. FMO’s ABCs For A Happy Marriage! Always admit you’re wrong even when you’re right. Be accountable especially when paying taxes to the IRS. Communicate constantly either with words or mental telepathy. Don’t try to change your spouse unless it is necessary. End all debates with a hug, a glass of wine, and a massage. Focus on making your self better than it was yesterday. Go for a fun run together in the morning if it’s not blizzarding. Have regular meetings with a Life Coach to discuss your goals. Invest in your marriage by giving yourselves nice big raises. Jot down any ideas that could translate into mega-wealth. Keep a list of everything you do together, with dates and comments. Learn how to agree to disagree, or vice versa. Master the art of small talk before moving on to any big talk. Never begin a sentence with the word ‘you’, or with profanity. Organize everything you own alphabetically into stackable boxes. Pray for longevity prior to each and every happy meal. Questions don’t always have answers that make sense. Recognize accomplishments with a handshake and milkshake. Spend money in hundreds while earning it in thousands. Touch more, argue less, is a way to decrease stress. Understand what is being said and unsaid by your spousemate. Visualize your marriage as a flower that needs daily watering. Write and hide anonymous little thank you notes to each other. X-Ray every box delivered to your home prior to opening. Your spousemate is your boss unless you get fired. Zoom out if zooming in is causing too many problems.